I started with dog sports in the beginning of the new millennium. When I got my first own dog I soon got involved in agility. I went to a basic agility course organized by Kisko Agility in 2001. I continued with a club called Koirakerho Tassut and with Janita's courses. I have been a member of board, a chairman and an agility instructor in different agility clubs that I have been representing. I am a qualified agility instructor and competition official. 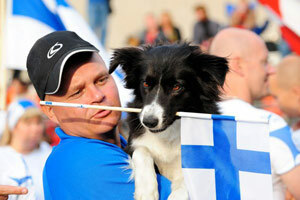 I have worked as an official in agility competitions and in search & rescue tracking competitions. I have been an agility instructor since 2003. Agility is the sport that is especially close to my heart. I want to keep developing my skills both as a handler and an instructor. It is quite unrealistic to think you can ever be "ready" in these things. I have been giving seminars not just in Finland but also in Sweden, Norway, Estonia, Italy, Czech Republic, Spain, Denmark, Germany, Austria, Japan, Argentina and Hungary. When I work as an instructor I try to get the handlers to understand their dogs and to find a common "language" to interact with these amazing creatures on agility course. Dogs can often do things that their handlers think they cannot do. It is important for me to get the handlers to trust and believe in their dogs and also themselves. 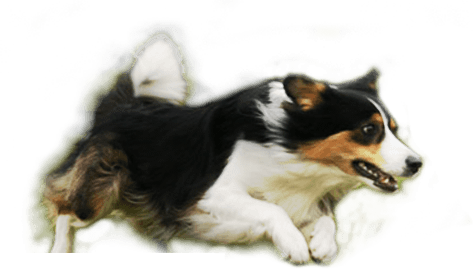 Trust and teamwork is required in everyday life as well as agility and other dog sports. The dog has to be able to count on the instructions he gets from the handler. The handler has to be able to trust the dog's ability to work independently. *Bianca (Fin ShCh Zabadou´s Bella Bianca), a Havanese who was the first of her breed to move up to agility class 3 and the first of her breed to qualify to Finnish Championships. Bianca was the best of her breed every year she was competing. Bianca was a very challenging dog to motivate. I learned a lot about motivating and rewarding a dog from her. *Zen (FI & S & N & DK Ag Ch, Nord Ag Ch, INT Ag Ch, FI & S & N Jump Ch, BH, AGI Nord Ch-2 2008, EO-Team winner 2010 and -11 Decathlete´s Sirius Black), is a Border Collie bred by Janita Leinonen. Zen has won the Finnish national team tryout competition in 2007 and 2008. She was on the Finnish team also in 2010. In the 2007 World Championships Zen was the fastest dog with a clean run on the team agility course and second fastest on the team jumping course. Zen was placed 9th on the individual jumping course. In the 2008 World Championships Zen won the individual jumping course and was the second fastest dog with a clean run on the team jumping course. The same year Zen was placed 2nd in the individual Nordic Championships and won a gold medal in the team competition. In the last four Finnish Championship team competitions Zen has been on the podium four times and on the winning team twice. Zen also has two team wins in European Open, in 2010 and 2011. For me Zen definitely is one of the best agility dogs in the world, if not the best. Her skills and ability to read the course never cease to amaze me. Zen competes in class 3 (out of 4) in obedience. Zen has had one litter of puppies. The winning team of European Open 2011 consisted Zen and three of Zen's offspring. My once in a lifetime dog – that's everything in one sentence. There are no words to tell how much Zen means to me. All the success we have had is a small thing compared to the magical feeling of being on course together with Zen: One Mind – a perfect understanding and trust between handler and his dog. To me AGILITY means exactly that, reaching that feeling. The everyday life and the other dog sports we have tried (for example messenger dog trial, tracking, obedience, water rescue and search & rescue) have been extremely easy and rewarding. Zen is a very easygoing and balanced dog. We have travelled together in competitions all over the world and travelling has proved that Zen has got better nerves than her handler. *Chi (FI Ag Ch, Beck´s Hill Goldeneye) , Border Collie, moved to us from Italy in 2009. Chi is a real child of nature whom I find a very challenging dog to train. Working with Chi has developed my skills as a dog trainer and I have learned to think "outside the box". Little by little the pieces have found their place and we have started to work quite well together in our main sport agility. *Dea, (FI Ag Ch, FI & S Sh Ch, JV-99, EUV-06, BH, AGI SM-3 2005 Faunittaren Dea Aurora), Belgian Shepherd Groenendal, is owned by Marjo Heino. Dea and I competed together in 2005-2006. We were placed 3rd in the Finnish Championships in 2005 and were on the Finnish national team in 2006. We were placed 5th in the Nordic Championships. I have competed with about 30 different dogs out of more than 10 different breeds in agility.